You may direct your charitable contribution to TU to the program, project, or department of your choice. Perhaps you have an affinity to a College or McFarlin Library. Maybe your passion lies with a particular sport. Or, like most of our alumni who received financial assistance when they were students, perhaps you would like to contribute to a scholarship fund to help a current TU student achieve his or her educational dream. No matter where your philanthropic interests lie, TU offers a multitude of giving opportunities for your consideration. It is impossible to overstate the importance of the TU Annual Fund and its impact on the day-to-day life at TU. Budgeted funds are earmarked for specific purposes and are often allocated before the fiscal year even begins. Annual Fund support, on the other hand, provides the needed flexibility to take advantage of unexpected opportunities or address unforeseen challenges that may have no other dedicated funding source. If you, your family or your organization is interested in establishing an endowed scholarship, please contact the Development Office at 918-631-2561. The College of Arts and Sciences provides its students with a broad foundation of study in the fine and performing arts, humanities, and social sciences. The college offers more than 25 major areas of study in disciplines as diverse as the fine arts, communication, computer science, languages, and psychology. Gifts to the Henry Kendall College of Arts & Sciences may be made to the college’s general annual fund, to support a particular department, or to provide support to literary journals such as Nimrod or the James Joyce Quarterly. Collins College of Business focuses on flexible programs, which meet the needs of its students, while providing graduates who meet the needs of the business and health care communities. The college offers undergraduates 13 major areas of study, including the recent establishment of a degree in Energy Management that now boasts an enrollment of more than 100 students. An additional 13 majors are offered at the graduate level, including a revamped Master of Business Administration program and joint MS/JD graduate degree programs in the areas of business administration, taxation, and finance. Gifts to the Collins College of Business may be made to the college’s general annual fund, to support a particular department, or to provide support to student-led efforts including Studio Blue (a marketing and design studio that focuses on providing support to area non-profit agencies) and the Student Investment Fund (a student-managed investment portfolio). As the largest of the academic colleges on the TU campus, the College of Engineering and Natural Sciences offers a challenging curriculum that encourages the development of problem-solving skills that require imagination and ingenuity, and a small student-to-teacher ratio of 11:1 that enhances the overall learning experience. These hallmarks are notably reflected in the impressive number of nationally competitive scholarships won by students in the college. Of the 111 national scholarships given to TU students in its history, 100 of them were awarded to ENS students. Gifts to the College of Engineering and Natural Sciences may be made to the college’s general Annual Fund, to support a specific department or to fund unique student-led service work projects such as building mobility devices for handicapped children, the student chapter of Engineers Without Borders or the Sustainable Engineering for Needy and Emerging Areas project. The College of Health Sciences is TU’s newest college, bringing together the School of Nursing, a physician assistant program, and the Departments of Athletic Training, Exercise & Sports Science and Communication Disorders. Additionally, the college houses TU’s faculty of Community Medicine and will advance the university’s strong partnership with the Laureate Institute for Brain Research. Interdisciplinary study is key to the College of Health Sciences, where students and faculty are encouraged to collaborate with other departments – and even other colleges – to find solutions. Health Sciences students can learn from their peers in engineering, law, psychology, computer science and business. Off campus, representatives from the college are encouraged to make a difference in the community where healthcare needs are many. Service learning is an important facet of a TU education, and Health Sciences is an field where a university can be a change agent. The University of Tulsa College of Law values its position within an excellent, private, doctoral-degree-granting university, and its partnerships with the community, the bench and bar, tribal nations and foreign institutions. The University of Tulsa College of Law prepares students from diverse backgrounds to excel in the legal profession through an intellectually rigorous program that promotes these core values: excellence in scholarship, dedication to free inquiry, integrity of character, professionalism, and commitment to humanity. Gifts to the College of Law may be made to the college’s general annual fund, to support a specific academic program, or to provide assistance to critical student learning opportunities such as national moot court competitions, professional internships, or for experiential learning in a university legal clinic. Our graduate students are integral and vital members of research teams, and work individually with faculty members who are on the cutting edge of their fields. They also work closely with faculty members in charting their course for their graduate studies in completing their master’s or doctoral degrees. TU is large enough to provide a wide variety of course offerings, faculty and professional advising, student services and extensive research opportunities. At TU, graduate students have opportunities to participate in research, internships or practica that give them first-hand experience in a particular discipline, while also affording them opportunities to publish their findings and present their research at conferences. Our students know what it is like to work in their field before they enter it as a professional. And in many cases, they have an offer to work in that field before they graduate. At the heart of every great academic institution stands its library, and at The University of Tulsa, our own iconic McFarlin Library is no exception. 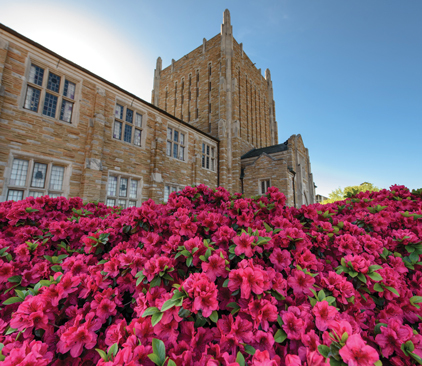 As the TU’s Grand Dame since 1929, McFarlin has been the physical and academic center of our beautiful campus. In its 80-year history, McFarlin has bolstered the research of thousands of scholars, informed countless research papers, and acquired more than 170,000 rare books, manuscripts, and other materials that are held in the university’s special collections. As a critical component of TU’s $400 million Embrace the Future campaign, McFarlin Library has undergone a major restoration, returning the building to its original grandeur. The new 16,000-square-foot Pauline McFarlin Walter Academic Technology Center houses modern computing laboratories and online instruction space, allowing the four stately reading rooms to be remodelled and returned to their primary purpose. Extensive reconstruction has allowed for access to the library once again through the original west entrance from the Albert Plaza, as well as from the north through the new Bank of Oklahoma Atrium. The Frances W. O’Hornett Grand Foyer leads visitors to the Cortland and Martha Deitler Cafe on the Plaza Level, and offers access to contemplative study space in the nearby Gray Student Commons and the exquisitely restored Ann and Jack Graves Faculty Study. The financial resources needed to sustain a world class library like McFarlin are vast. However, through the generous support of friends, alumni, and other benefactors of The University of Tulsa, we are able to provide TU students and faculty with the academic resources necessary to succeed in their scholastic enterprise. The University of Tulsa, an NCAA Division I member for all its 18 teams, joined the American Athletic Conference in July 2014. Before becoming a member of the American, Tulsa teams won a league-best 59 Conference USA championships in nine seasons. Tulsa has made numerous post-season appearances and earned individual national accolades across all sports programs in the last decade. Tulsa has won six national championships, four in women’s golf (1982 and 1988 NCAA and 1980 and 1982 AIAW titles) and two in men’s basketball (1981 and 2001 NIT). Gifts to the Department of Athletics may be made to the general annual fund, to the Golden Hurricane Club, to the Lettermen’s Association, to any one or more of the 18 men’s and women’s athletic programs, or to a variety of student academic services.